Do you waver as you reach for that bacon sarnie or glass of wine? Science tells us these things can be bad for us in excess. But in this week's Scrubbing Up health column, risk expert David Spiegelhalter, says even those habits linked to risk can have benefits - and maybe people should be a little easier on themselves. I own up. I am a serial risk taker. I live in a flood zone, cycle without a helmet, drink alcohol and on Sunday I had bacon for breakfast. I know that this is hardly Formula 1 racing, but reading the papers might suggest otherwise. When the advice from cancer experts for avoiding bowel cancer is "try to avoid processed meats such as bacon, ham, salami, corned beef and some sausages", and women fearing breast cancer are told "there doesn't seem to be a threshold at which alcohol consumption is safe", then perhaps people like me are being grossly irresponsible. Such stories bring a predictable response. The threat from bacon sandwiches gave the opportunity for The Sun to produce the classic headline "Careless pork costs lives", while the Daily Telegraph was true to form and frothed on about the nanny-state denying us our bacon birthright. But all these health warnings tend to have little influence on behaviour, just as scientific derision for homeopathy appears to have no effect on many people's enthusiasm. So who is being unreasonable - the epidemiologists who give us health advice, or the public that duly ignores it? The reasoning behind these health warnings seems to be this: if you do more of something pleasurable (which we shall give the generic name yum) there is a higher risk of something bad occurring (yuk), so therefore you should avoid yum. But when presented with this argument you might ask two questions. First, maybe the pleasure of yum makes the risk worth taking, especially if yuk might occur a long time in the future? Second, maybe there are other benefits of yum than could cancel out the risks of the particular yuk that has been identified? 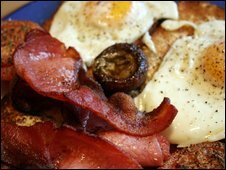 So suppose bacon sandwiches are your particular yum: research shows that 50g per day - that is a great greasy three-rasher sandwich - increases your risk of bowel cancer by 20%. But this means that out of every 100 people who stuffed down that big bacon sandwich every day of their lives - just imagine them - the number of bowel cancers would rise from five to six. And this possible harm is way in the future. Again The Sun put in their inimitable style: "I would rather have the occasional bacon sarnie than be 110 and dribbling into my All-Bran". In addition, if a middle-aged woman gave up alcohol, it might reduce her risk of breast cancer, but could increase risk of some other cancers as well as heart disease. So we need to look at the whole picture before trying to get people to change what they do, since everything has benefit and harms - just think of the joggers who get knocked down by cars - and people need to be able to find their own balance. These issues are tricky, and reflect a basic tension between individuals and society's points of view. That is why it is understandable that attempts to create these shifts in behaviour by exhorting people to change tend to fail - and make them anxious and guilty. It explains the current call for society-wide actions such as minimum alcohol pricing, and enthusiasm for 'nudging' people towards better behaviour. When you find the muesli at the front of the breakfast counter, and the bacon sandwiches in an unmarked gloomy corner of the canteen, you know you're being nudged. So as you reach for your yum, perhaps sometimes pause a moment and realise that you are taking a gamble on the yuk occurring, but that it may be a risk worth taking. What kind of risks should we be taking - and do the warnings and health advice have any effect?